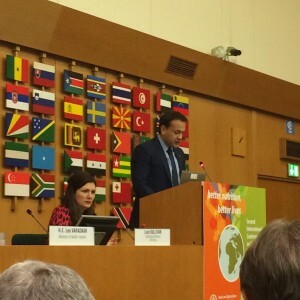 Minister for Health Leo Varadkar has told the Second International Conference on Nutrition that his Department will start work on a National Nutrition Action Plan in order to improve diet, health and wellbeing among Irish people. Minister Varadkar also welcomed the Conference’s endorsement of the Rome Declaration on Nutrition which commits countries to eradicate hunger and malnutrition worldwide. The Declaration addresses under-nutrition in children, micronutrient deficiencies in women and children including anaemia, and reversing the trend in obesity. “The Conference’s decision to endorse the Rome Declaration is a welcome step in addressing global hunger and malnutrition. Every country now has a stronger role to play in tackling these issues at home and abroad,” Minister Varadkar said. Minister Varadkar led the Irish delegation and delivered the Irish country paper. The Minister told delegates that Ireland is playing its part in improving global food and nutrition with measures to develop the agri-food sector in a sustainable manner through ‘Origin Green’. This involves the sustainable production of safe high-quality food of high nutritional value. Origin Green will help to meet the ever-growing demand for food and nutrients in Ireland and around the world. Eradicating malnutrition is also at the heart of Ireland’s international development and foreign policies including the Irish Aid programme. A quarter of all children globally are unlikely to develop to their full potential because they suffer from chronic under-nutrition. Ireland is also involved in the Scaling Up Nutrition Movement, which supports high-burden countries to develop and implement national nutrition strategies. The Second International Conference on Nutrition is a high-level inter-governmental conference addressing the global nutrition issues of the 21st Century. Those attending include Pope Francis, Health and Agriculture Ministers from around the world, and academics and experts in related areas. The Rome Declaration was negotiated by WHO and FAO member countries acting through a joint Working Group along with an accompanying technical Framework for Action to guide its implementation.